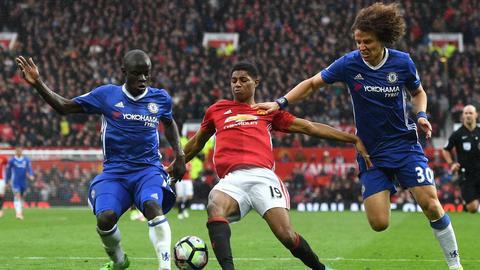 Manchester United forward, Marcus Rashford, scored a goal on Easter Sunday as the Red Devils went on to beat Chelsea 2-0. Photo courtesy of NBC Sports. After an incredibly entertaining match between Manchester United and Chelsea, the league-leaders find themselves only four points clear of second-place Tottenham. José Mourinho’s United prevented Chelsea from getting a single shot on target during Sunday’s match as the Red Devils prevailed 2-0. Now, with only six league matches remaining, it appears that Chelsea’s grip on the title isn’t as tight as what everyone had thought. Tactically, Antonio Conte was outdone by his counterpart in Mourinho on Sunday. This hints at some weakness in the league-leaders and potentially an opportunity for Tottenham. For Spurs, their remaining games include matchups against rivals Arsenal, Man United and West Ham. Chelsea will see the likes of Everton and bottom-dwellers Sunderland, Middlesborough and mid-table Watford. The next month will certainly heat up as this is the closest the title race has been this year since around November. In fact, the next match for Chelsea is against Tottenham in the FA Cup on April 22. Perhaps a prelude to the season finale, this matchup will speak volumes of how these teams will fare in the final stretch. Tottenham have won their last two games by a scoreline of 4-0 and haven’t lost in the league since February. Chelsea, on the other hand, have two wins and two loses so far in the month of April. The two loses have come to Man United and Crystal Palace, with wins against Manchester City and Bournemouth. Form-wise, Spurs certainly look poised to maintain their run despite their tougher schedule to close out. Just by the eye test, the Blues appear to be in for a long final month in the race for the Premier League crown. For Chelsea, it will be tough to grab all six points out of their next two league games (home to Southampton and away to Everton). Relegation-battling Borough could also prove to be a tough test and it’s still possible that Sunderland will be fighting to avoid a bottom-three finish in Chelsea’s final game. Prediction: Chelsea will only get 11 points out of their remaining six games. As for Tottenham, the road is going to be much tougher in their quest for their first title since 1961. However, the great form of Harry Kane and Delle Alli will prove to be vital. With tough local derby matches upcoming, motivation will be much easier to find for Spurs. Prediction: Tottenham will finish with 12 points. Grabbing ties from Leicester and Man United, key wins against rivals Arsenal and West Ham will help propel them forward to a dramatic final day in which they win the title.